The case involving the Republic vrs Nana Afua Nketia Obuo II and twelve others at the Koforidua High Court, has been adjourned. 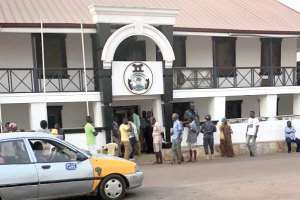 One of the factions in the Akuapem chieftaincy dispute is facing a contempt of court suit for defying a court injunction which was restraining both factions from engaging in any chieftaincy activities. Presiding judge, Her Ladyship Cecilia Naa Shormeh Davis, who identified some lapses in the suit, adjourned the case to March 8th 2018, and advised lawyers to rectify the errors. The dispute follows the death of Chief of the area, Oseadeyo Nana Addo Dankwah III, two years ago. The controversy is over the eligibility of the candidates vying for the stool. The impasse prevented the people of Akropong from hosting the 2017 Odwira Durbar. About 30 armed men from the National Security headquarters in Accra stormed the Okuapemhene's Palace in January 2018, and forced all occupants of the building out, following reports of a possible chieftaincy clash over the imminent installation of two chiefs in the area. The Adontehene of the Akuapem Traditional Area, Nana Djan Kwasi II, subsequently gave the National Security operatives a 24-hour ultimatum to vacate the palace or face their wrath. The National Security operatives had earlier in January picked up detained at the police headquarters in Accra the queen mother and two other chiefs of the Akuapem Traditional Area and detained at the police headquarters in Accra. The three were reportedly fueling a long-standing chieftaincy dispute in the area. The seven-member committee mediating the chieftaincy impasse also condemned the raid and subsequent takeover of the palace by National security operatives. Addressing a news conference, the Chairman of the Committee, Otuobour Gyan Kwasi II, Aburihene and Adontenghene of Akuapem Traditional Council, expressed their disappointment with some politicians whom they claim have interests in the ongoing traditional unrest at Akropong.